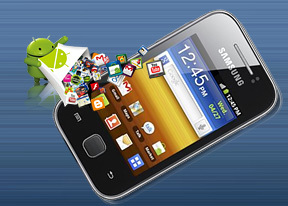 The Galaxy Fit S5670 is compact and simple – a smartphone that novice users will be happy to explore. At 102.9 x 57.9 x 12.2 mm, the handset weighs 96.8 grams: easy to handle and with a reasonably solid feel. The S5360 Galaxy Y is as simple as it gets - it's not a head-turner and it's all plastic, but to be fair, it's good quality. The patterned back is nice to the touch and good at hiding fingerprints, while the front is taken up entirely by the screen and black bezel around it. The front of the device features the 3” TFT touchscreen of QVGA resolution. The capacitive unit is very responsive and supports multi-touch. The image quality however is quite low. It's not just the low resolution - the display has poor viewing angles, low brightness and contrast. Above the screen, there’s a proximity sensor. An ambient light sensor is missing so you’ll have to manually set the brightness to match changing lighting conditions. Even at maximum brightness, sunlight legibility isn't up to scratch. Below the display, there is a single hardware button: the central Home key with two capacitive controls either side: Menu and Back. It's the standard Samsung layout. The Home button is set within its own frame, slightly recessed. It has a nice feel to it thanks to the brushed-texture finish. There's no haptic feedback for either the interface or the capacitive keys. The top of the phone features the connectivity ports: a 3.5mm audio jack and the MicroUSB port, hidden under a plastic flap. At the bottom of the phone, the mouthpiece is the only thing to note. On the right, there’s a single power/lock button. It’s thin but sufficiently raised with good press. The left side features only the volume rocker, thin but prominent enough. The 2MP camera lens is at the back along with the loudspeaker. There's virtually no scratch or fingerprint protection for the camera lens, while the loudspeaker has a small nub that keeps it from getting completely muffled. The back has a textured non-slip finish. It doesn’t quite affect the actual grip but makes the device a little more appealing. The matt finish is fingerprint-proof but the thin grooves might gather dust over time. Removing the back panel reveals the 1200mAh Li-Ion battery. It sounds like a low capacity for a power-hungry Android phone, but we can’t comment on its real-life performance just yet. You also have access to the microSD card, which can be hot-swapped at this point. The SIM card finds its place under the battery, where it's held by a standard metal hinge. The Samsung S5360 Galaxy Y is a compact, light phone that sits comfortably in the hand. The materials and build are quite good for the price range. Scratches on the back won't be very apparent but you need to take some care for the front - other than that, the Galaxy Y feels like a reasonably sturdy phone.